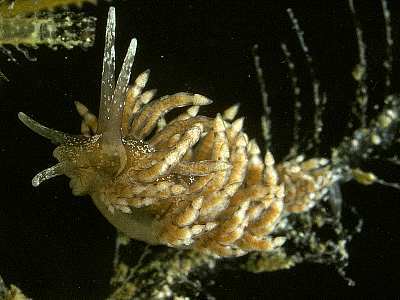 Description: This nudibranch is greyish-white in colour with scattered patches of green or brown pigment. Each ceras has a white band towards its tip and 2-3 green or brown bands below this. The digestive gland is white and is visible through the ceratal epidermis. The rhinophores are smooth with white tips and a lower green or brown band. The larger individuals may grow to a length of approximately 20mm. Habitat: Eubranchus vittatus feeds on the calyptoblastic hydroid Kirchenpaueria pinnata. The spawn consists of a flared, cup-like, circle of white ribbon with a basal pad attaching it to the hydroid stem. Distribution: A frequent species in the north west of the British Isles but much scarcer in the south, although records extend to Torbay, Devon and Galicia, NW Spain. Similar Species: This species is similar in appearance to Eubranchus doriae but has smooth, unswollen cerata with bands of dark pigment. Cerata not swollen, in vertical rows. Cerata with dark bands, green pigment and white spots on body. Picton, B.E. & Morrow, C.C. (2016). Eubranchus vittatus (Alder & Hancock, 1842). [In] Encyclopedia of Marine Life of Britain and Ireland.